Mayo sit joint top of Division 1 of the league after an eventually comfortable five point win over Cavan in MacHale Park tonight. They sit on top with Kerry and it is the first time in 13 seasons Mayo have won their opening three games. That came in 2006 when they went on to win their next two games as well but for now Mayo will be very content with this start to the league given their indifferent early season form in recent seasons. They led by three points at the break and despite their best efforts in the third quarter, Cavan could never cut into that gap. And when Mayo subs Donie Vaughan and Brian Reape both fired over within a minute of each other with ten minutes to go, Mayo were five clear and the result was beyond doubt. Five points turned out to be the final gap as James Horan’s second term in charge of Mayo got off to the best possible start. But displays from man of the match Ger Cafferkey, Aidan O’Shea, Michael Plunkett, Jason Doherty and Andy Moran paved the way for Mayo. The hosts took in a one goal lead at the break thanks to Evan Regan’s goal in first half injury time. Matthew Ruane’s shot for a point dropped short and Regan contested the ball with goalkeeper Raymond Galligan. Cavan looked for a free out and it was the type of challenge typically given in favour of the goalkeeper but Anthony Nolan told didn’t agree and the goal stood. Cavan had led by 0-4 to 0-1 after ten minutes. Dara McVeety from play and frees from Jack Brady (2) and Raymond Galligan had Cavan in good shape. But Mayo eased back into the game. Andy Moran struck two first half points and had his fingerprints over much of Mayo’s good work. A Jason Doherty free after he earlier forced a good turnover had the sides level at 0-4 each after 17 minutes. They nearly struck a fortuitous goal after 22 minutes when corner-back Stephen Coen’s point effort dropped short and Galligan did superbly to tip it around the post. A pointed offensive mark from Aidan O’Shea and a free from Doherty had Mayo two up before Regan’s goal. Cavan wing-back Conor Rehill kicked two good points either side of the goal to keep Cavan in the reckoning at half-time. But that was as close as they got and Mickey Graham’s men are at the opposite end of the table, pointless from three games. 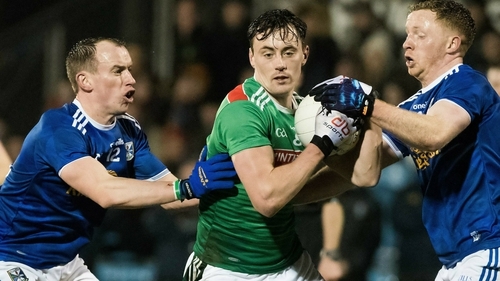 Mayo: D Clarke; S Coen, G Cafferkey, K Higgins; L Keegan (0-01), M Plunkett, P Durcan; D O’Connor (0-01), M Ruane; F McDonagh (0-01), A O’Shea (0-01, 0-01 mark), J Doherty (0-03, 0-03 frees); E Regan (1-02, 0-02 frees), A Moran (0-02, 0-01 mark), C Moran. Subs: C Moynagh (0-01) for T Galligan (h/t), P Smith for N Murray (44), N Clerkin for Mackey (61), N McKiernan for Madden (41), O Pierson for J Brady (67). Referee: Anthony Nolan (Wicklow).